Barcelona is huge… I’ve lived here my entire life and I can’t tell for sure I know it well. There’s always a new way for going to work, and every time you find a new little plaza or park to fall in love to. So… I’m going to spend 2 days in Barcelona. Where should I go? Everywhere! But there’s no time… So I recommend you to visit less monuments and spend more time walking around the neighborhoods, getting our mood, tasting our food and knowing our people! Let’s gets started. It is a nice idea to spend the first morning in Park Guell. There you’ll discover why Gaudi is so important for the city while you have a great panoramic and colorful view of Barcelona. When you get hungry, you’re less than 10 min walk from Gracia neighborhood (the favorite quarter for many Barcelonans). In Gracia you can find bars and restaurants of any kind, from typical Spanish places to Turkish/Italians combos, and I’m sure you’ll enjoy the “little town” atmosphere, the plazas, the narrow streets and the people. Don’t be afraid to get loose a bit there. When the dawn arrives, you can go to Passeig de Gracia and visit Casa Batllo and La Pedrera. Definitely the best facades of Barcelona are in this street (keep one eye up! ), along with beautiful shops and restaurants. If you have some time left over and reach the end of the street, you’ll get into Plaça Catalunya, our most important plaza. Next morning you should visit the Sagrada Familia. Probably you’ll have to wait in line a while before you can get in, but it’s worth the time. Then have a good breakfast, take a little trip to Montjuic and go in the cable car before dinner. You’ll see beautiful views of the entire city, from the beach to Tibidabo. 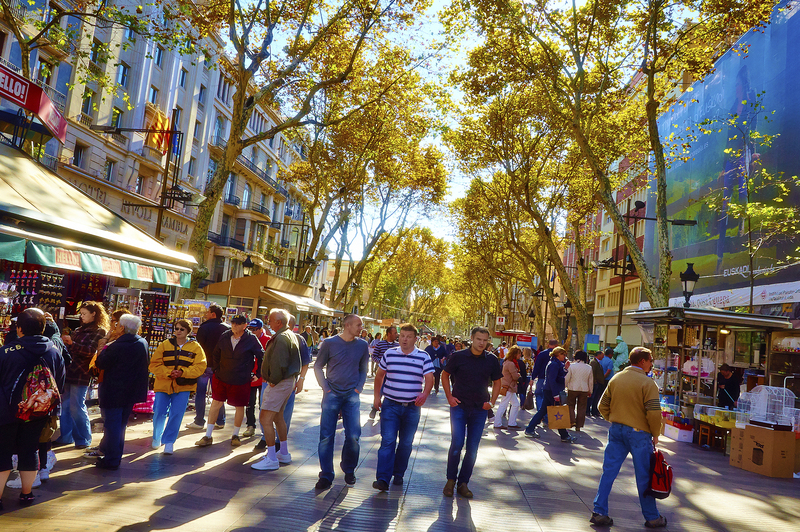 Then walk the docks toward Barceloneta neighborhood and take a Mediterranean Spanish dinner in the promenade. With your energies recovered, you should visit the center of Barcelona: the Raval, the Gothic and the Born quarter, as well as Las Ramblas. There you can find everything you can imagine. The Raval is darker, bohemian and has the MACBA museum in the middle; the Gothic is odd, like traveling in time 200 years ago; and the Born is a labyrinth full of shops, restaurants, churches, museums and the outstanding Palau de la Musica.